As China's deep-sea technological forays keep making international headlines, the Global Times had an exclusive chance to explore the home of China's most advanced equipment in the coastal city of Qingdao, where Jiaolong, the manned submersible that had dived to the world's deepest trench and a constant visitor to the otherwise unreachable depths of the South China Sea, is based. The red and white Jiaolong is undergoing maintenance at a plant of the National Deep Sea Center, around 50 kilometers from downtown Qingdao, East China's Shandong Province. Its next scientific mission is meant for the South China Sea next year, Ding Zhongjun, deputy chief engineer at the Center, told the Global Times. What sits together with Jiaolong in the plant is a simulated training system of the same size and look. The system can simulate Jiaolong's operations and troubleshooting during emergency, said Ding. The system is the only simulation operating device of its kind in the world, said Ding. According to the Center, Jiaolong will start a global expedition in June 2020, mainly covering countries along the Belt and Road and the South China Sea. The Jiaolong's as-yet unnamed mother ship will also carry the unmanned deep-sea research submersibles Qianlong and Hailong that can gather quality data during the expedition's South China Sea stop, Ding said. 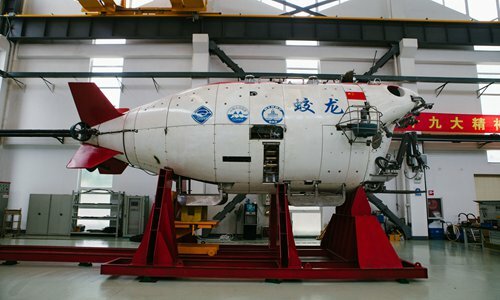 The use of a manned submersible is a landmark in China's deep-sea exploration as scientists can reach the seafloor for a closer look and complete refined sampling missions. China is developing a manned submersible that can dive to 11,000 meters and the vessel is expected to go for sea trial in 2021. This means three years hence, China will be a leading player in deep-sea equipment that can reach the deepest regions, Ding added. Jiaolong, which is capable of diving to a depth of around 7,000 meters, is the perfect underwater vessel to explore the South China Sea, which goes down to 5,000 meters at its deepest, said Ding. Jiaolong normally carries three people, including a pilot and two scientists. A dive, which starts around 7:00 am, normally takes 10 hours. The three people could only move in a rounded space that has a diameter of 1.4 meters, said Gao Xiang, a senior engineer at the Center. In April 2017, Jiaolong finished three dives in the South China Sea and brought up rich data and samples significant to explore the cause behind sea chain, seafloor structure evolution and biodiversity of the waters. The South China Sea is critical as a world trade route. According to the website of US Energy Information Administration, in 2016, almost 40 percent of global trade of liquefied natural gas, or about 4.7 trillion cubic feet passed through the region. Over 40,000 ships sail through the South China Sea every year, and over half of China's sea routes pass through the region, said Zhu Feng, executive director of China Center for Collaborative Studies of the South China Sea at Nanjing University. According to China's oceanic authority, the next step for the country's deep-sea technology is the development and testing of a drilling facility, Shenlong, mining facility Kunlong, information sharing system Yunlong and comprehensive platform Longgong. The equipment are expected to be finalized in 2020 and it's a matter of time when they will enter the South China Sea in the near future, said Ding. When all the equipment is put into operation, it would make China a leading player in global deep-sea technology, Ding noted. Meanwhile, scientists underscored that China's exploration in international waters is not about expansion or preempting resources, but providing information to solve scientific puzzles and promoting joint development of humanity. China shares the responsibility for global marine security, and also needs first-hand information to have a bigger say and deeply get involved in global marine governance. The use of such equipment is necessary to serve this goal, said Ding.